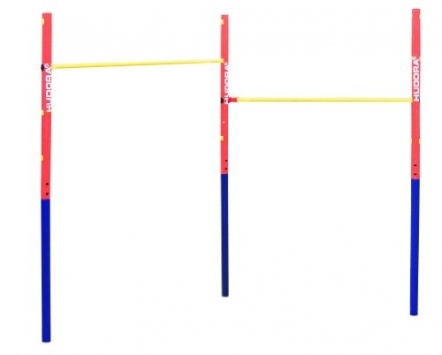 Double horizontal bar set for outdoor use. 4 heights, adjustable from 71.5 to 150 cm. Set up angle adjustable up to 80°. 6 poles each with 107 cm height with cross strengthened supports for the bar. Maximum user weight 100kg (15st 10lbs). Basic training for younger gymnasts is possible on home bar apparatus, especially kip training. Endless repetitions are the only way to master this essential bar move and this is certainly something which you can do at home.